5/2/2013 – EGLIN AIR FORCE BASE, Fla. (AFNS) — A new, lighter, mobile 30 mm ammo linker system is set for delivery to Air Force Special Operations Command units here in May. The 89-pound apparatus can feed 15 unattached 30 mm rounds into MK-15 links via a crank system and was created and designed by Eglin Air Force Base’s munitions materiel handling equipment Airmen. 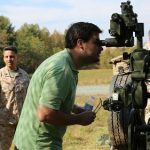 The MMHE Focal Point, a section under the Air Force Life Cycle Management Center’s armament directorate, specializes in developing locally manufactured equipment for the Air Force ammo and weapons communities. Those ideas and concerns are defined and passed up the chain of command for approval. If the idea is feasible, cost-effective and to the benefit of the Air Force, a design team begins the creation process on the product. 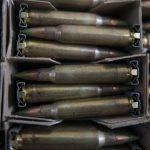 The initial AFSOC request was for a hand-held de-linker to easily and safely remove the 30 mm ammunition rounds from the links. “The previous method of using the force of your hands was slow and potentially dangerous,” said Tech. Sgt. Mike Stratton, the linker project manager. Engineers and drafters went to work creating a new product to meet the specific requirements to accomplish the task. The result was a 7-pound de-linker tool that resembles a very large set of plyers, but fit the 30 mm round perfectly. The de-linker reduces the amount of force to remove the ammo to a minimum. After trying out the de-linker prototype, Stratton and his team received feedback that AFSOC Airmen could use a quicker, deployable way of connecting the ammo into the MK-15 belts. 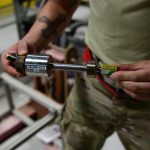 “We evaluated the linking process at Hurlburt Field, and the ammo troops told us the current machine is too large, expensive, complex and not very mobile,” said Ben Chambliss, the linker project engineer. Again the MMHE developers began designing to meet this new requirement. MMHE created a new linker resulted that weighed and cost one-tenth of the current linker in use. The linker requires no electricity with the use of a hand crank, but it can also be controlled with an electric drill for faster speed. It is 58 inches long and 18 inches wide. “(The linker) can be tossed in the back of a truck or on an aircraft and taken to wherever it’s needed,” Chambliss said. An MMHE project goes through two main phases, the prototype phase and first article phase. The prototype phase is the creation by MMHE and the testing of the designed product by the customer. In the first article phase, another product is created with the changes and corrections provided from the customer testing. The new (first article) product goes back to the customer for final validation. Once it’s cleared by the customer and approved by an Air Force safety board for operational use, the blueprints become available to DOD personnel via a secure website. 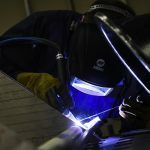 The linker/de-linker prototypes are already in use by the 27th Special Operations Maintenance Squadron at Cannon Air Force Base, N.M.
At any time, the MMHE Airmen have as many as 25 new pieces of equipment in development for Air Force warfighters.